IBASSIN: 2018 Bassmaster Elite Lake Martin Day 3: Takahiro Omori Continues Lead with 32-11lbs! 2018 Bassmaster Elite Lake Martin Day 3: Takahiro Omori Continues Lead with 32-11lbs! Crankbait and current key to Tak's dominance. 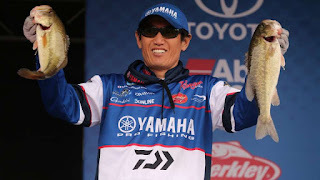 While fishing Saturday’s semifinal round of the Bassmaster Elite at Lake Martin presented by Econo Lodge, Takahiro Omori caught a bass that had two crankbaits in its mouth. One was a chartreuse colored bait that Omori had lost on an underwater tree branch Friday, and the other was the red bait he fished with most of the day Saturday. In 287 events with B.A.S.S., Omori said he’s never had anything like that happen before. But it’s been a charmed tournament for the Japanese-born angler turned Texas resident. Omori utilized one tiny spot on Lake Martin for the third straight day Saturday, landing a five-bass limit that weighed 12 pounds, 13 ounces. He’ll now lead the field into Championship Sunday with a three-day weight of 45-8 and a chance to claim his seventh career victory. “That crankbait is just a once-in-a-lifetime story,” Omori said. “I think maybe what happened is that it got hung up and the fish ate it before. Then it ate the other bait today. Omori has been traveling up the lake each day to a small nondescript spot that can’t be easily accessed. He has to trim his outboard up to get through some extremely shallow water and then use his Power-Pole shallow-water anchors to hold his boat in place while making continuous casts to an area about twice as wide as a bass boat. So far, it’s been worth the trouble. Omori landed 18-2 during Thursday’s first round and followed that with 14-9 Friday. He’s left with the fish still biting each day, and he’s hoping the spot has one more good day left in it. His lead is anything but rock solid, with four anglers within about 6 pounds of the lead. Rookie Roy Hawk caught five bass that weighed 12-10 Saturday and pushed his second-place total to 41-6. He said he might be even closer to the leader if it hadn’t been for one missed opportunity. He said the big fish caught him off guard. Though Lake Martin is known for its massive population of spotted bass, Hawk has been targeting largemouth most of the week. All five of the fish he weighed Saturday — and 12 of the 15 he’s weighed this week — have been largemouth. He admitted he had to work harder for them Saturday. Behind Omori and Hawk, Washington pro Luke Clausen caught 13-3 and pushed his three-day total to 41-3. Like Hawk, he said fishing was much tougher Saturday — thanks mostly to the heavily overcast conditions. If it hadn’t been for a 3-6 spotted bass near the end of the day, Clausen said his total would have been much lower. The Top 12 remaining anglers will now advance to Championship Sunday with a chance to win the $100,000 first-place prize. Takeoff will be at 6:15 a.m. CT from Wind Creek State Park, with the weigh-in scheduled for 2:40 p.m. back at the park.